Confederacy, 1861 (May 12) Vera Cruz, Mexico via Confederate New Orleans La. 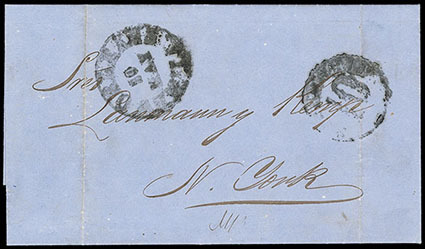 to New York, blue folded letter datelined "Va Cruz Mayo 12 de 1861" and with blue-green "L.J. Chorro, Vera Cruz" merchant oval on reverse from the Lanman & Kemp correspondence, bold "New Orleans La., May 19" CSA cds and matching "Steamship / 10" in circle due rating handstamp; file folds, F.-V.F. and scarce Mexico incoming CSA transit use. 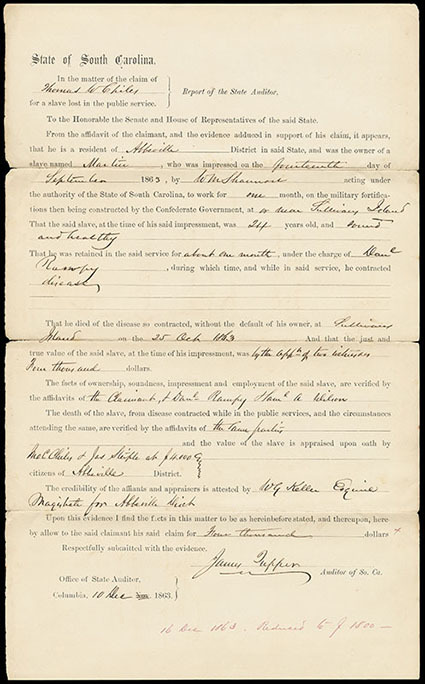 Confederacy, 1863-64, Correspondence Concerning Claim of Slave who died Building Military Fortifications in South Carolina, group of letters and affidavits concerning the use of a slave in Abbeville District for building defenses near Charleston in October 1863, includes affidavit from Asst. Surgeon at Mt. Pleasant who treated slave Martin who died of affliction of the brain while in Government employ under Capt. 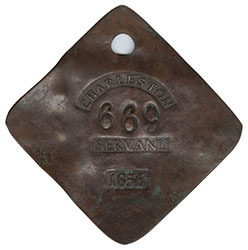 Lee as Engineer; original $4000 appraisal of slave by Chiles & Steifle; Official State of S.C. claim from auditor in the appraised amount of $4,000; South Carolina $1,800 receipt for payment of claim; etc., Very Fine and interesting group. 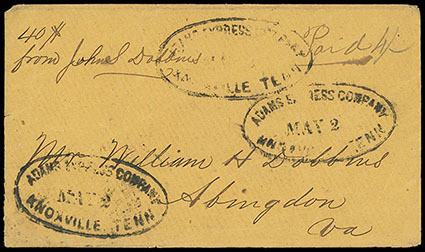 Confederacy, Adams Express Company, Knoxville, Tenn., May 2, three strikes of oval handstamp on money letter to Abington, Va. with "Paid 4/-" (bits, 50¢) express rate, endorsed at top left "40$ from John Dobbins", trivial edge wear, Very Fine and rare. Confederacy, "April 13, 1861" Surrender of Fort Sumter, dated framed ALS letter signed "W.D. Simpson" on the staff of General Milledge Luke Bonham at Fort Sumter, reading "April 13, 1860, I write to inform you that Beauregard has taken Fort Sumpter. Maj. Anderson surrendered today at 2' c'clock. The Northern steamers tried to run in but they saw such a welcome of cannon balls that they concluded that it was a bad job and left. The last news said that there were three of our men wounded slitly. Yours, W.D. Simson", framed with three Fort Sumter engravings before and during the bombardment, Very Fine. William D. Simpson (1823-1890) was a legislator, judge and South Carolina governor. In 1860 Simpson owned thirty-one slaves employed on his landholdings in Laurens District. During the 1850s, he served two nonconsecutive terms in the South Carolina House of Representatives. In 1860 he was elected senator from Laurens District and served until 1863. When war broke out, he was on the staff of General Milledge Luke Bonham and participated in the siege of Fort Sumter and the First Battle of Manassas. Returning to South Carolina, he helped organize the 14th South Carolina Infantry and rose to the rank of lieutenant colonel. He saw action at Seven Days, the Second Battle of Manassas, and Antietam. Upon winning a special election to the Confederate Congress in 1862, he resigned his commission and his state Senate seat. He was reelected and served until the end of the war. Confederacy, (Inbound Butterfield Overland Mail) 1861 (Mar. 6) Saint Louis Mo. to San Antonio Tex., C.S.A., sharp "Saint Louis Mo. 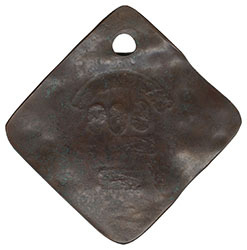 Mar 6, 1861" cds cancels 3¢ red (U28) star die entire, Extremely Fine and scarce use to Confederate Texas. 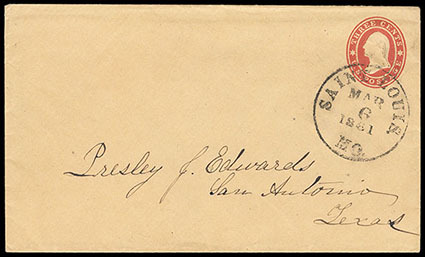 This entire was postmarked on the day Texas was admitted to the Confederacy. 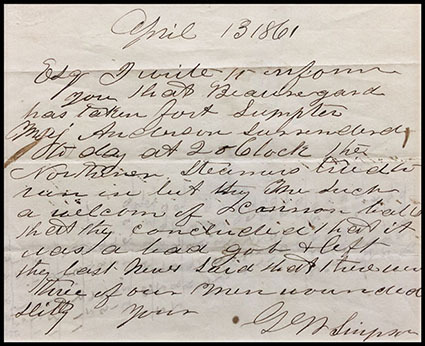 Mail had not yet been suspended between North and South, so this letter was carried the full distance by the U.S. mail service via the Butterfield Overland Mail on one of the last trips over the route. Because service on this line had been seriously disrupted by the Confederates through Texas and New Mexico, on March 12th 1861, Congress ordered that the route be discontinued and operations transferred to the Central Route.